Many of my blog posts seem to end up being about my puppy dog Bertie – not by design, more by default. It’s amazing how a curly-eared, doe-eyed, mischief-making, feather-legged, smooth-as-silk-coated, chocolate brown cocker spaniel cross can take up so much of my time, not to mention affection. Anyway, back to BJ. Spending an hour listening to him talk was one of the best things I’ve done all year. 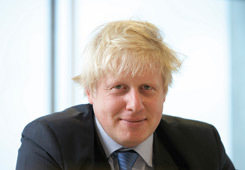 Boris is a dazzling speaker – witty, engaging, erudite, encyclopaedic in his knowledge and self-deprecating in the way only the English can be; he referred, for example, to a small sporting event that took place in London last year and seemed to go quite well! He was given the theme ‘the power of the written word’ but he also spoke in praise of urbanisation reminding us that 89 per cent of the Australian population live in urban areas, a density which rivals that of Monaco. He wove in all sorts of literary and cultural references from Virgil to Chaucer, Star Wars and Harry Potter never missing a beat or an opportunity to refer to his beloved London, Routemaster buses and the Oyster card (with a little side swipe at our Myki system). And, of course, he mentioned his book Johnson’s Life of London here and there. This was a writers’ festival after all. He’s clearly fond of Australia and Melbourne – like Prince Charles, he spent some time at Timber Tops – and talked about London as Melbourne’s Antipodean mirror. With so many Aussies in London (are they still all in Earl’s Court? ), he declared himself Mayor of Australia’s 12th largest city! It was heartening to hear a politician – and a Conservative at that – talk so passionately about cultural and linguistic diversity. London wouldn’t be London without its rich blend of migrants from different countries and cultures with over 300 different languages spoken. What a pleasant contrast to the inhumane refugee and asylum-seeker policies cooked up by our ‘turn back the boats’ politicians on both sides of the divide. He wrapped up his talk by coming back to words and writing. Asked what he will do when he retires, Boris owned up to a secret desire to write a rip-roaring blockbuster, the kind of book that you’d find at an airport bookshop complete with pink embossed writing on the cover. He’d write under a pseudonym, something like Rosie M Banks. If his thriller is anything like his speeches, it will be utterly compelling.